Amaranthine brings you this stunning Native Passion Arrangement. 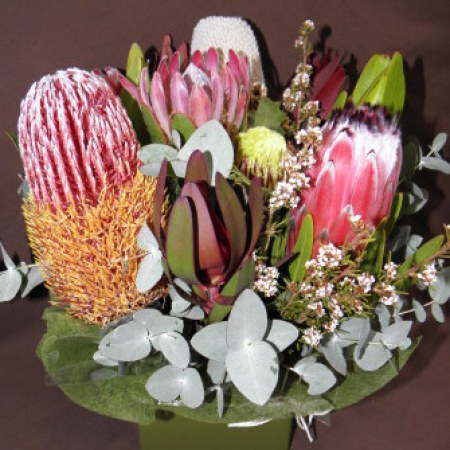 This long lasting arrangement includes native flowers like Pink ice proteas, the Australian banksia, green and red leucadendrons, native gum and wax fill this arrangement with colour. A long lasting and colourful display to say I love you, I miss you, thinking of you, our thoughts are with you, Happy Birthday or just because you can! From Amaranthine Flowers By Design, Charlestown Square, Newcastle.